For an adventure of a lifetime, college-aged students should consider studying in London. The vibrant, cosmopolitan culture, coupled with the rich history of its surroundings, draws more international students to London than any other city in the world. Roughly 100,000 students studying in this capital city are from 200 different nations. It is truly a global city where people from the around the world come together to learn with and from one another. When students are considering where they want to earn their degrees, many of them take the opportunity to spread their wings and attend school far away from home. This forces them to live independently and learn how to survive on their own, while leaning on a network of friends at school for support. The journey can be a scary endeavor, making it important for students to consider their options and make good decisions for themselves. 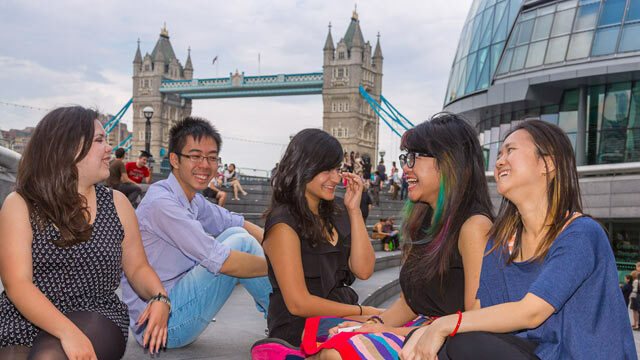 When identifying options, students can consider these five great reasons to study in London. London is one of the most welcoming cities in the world, often catering to their visitors and making sure they are well taken care of during their time in the city. Many of the local universities in London provide students with free support services. International students in London will always be able to feel at home for just a moment when they hear their native language spoken — over 300 languages can be heard around the city. This safe, friendly city helps students develop an international appreciation for diverse cultures. Companies around the world recognize and honor degrees from London’s universities. These multicultural companies understand the rigor in the local programs and realize that all people need a place to start in their careers. Many of the local businesses provide London students with work placements during their studies so that they can get their feet in the door and work at an entry-level position. With such experience, international companies will be hunting down graduates and recruiting them right after they earn their degrees. This lively city provides students with many societies and clubs for networking purposes. Lifetime friendships can develop between students as they share multicultural experiences with one another. Students in London will never be bored outside of the classroom. There are many things for youth to do, including eating at a classy restaurant and dancing in a night club to attending a concert and going to the theatre. London prides itself in housing four top-notch universities in the world that consistently rank in the top 40 institutions worldwide. That is more than any other city in the world. In all, there are 45 prestigious universities in London that employ some of the best leaders in their subjects to educate the youth. They take pride in turning out some of the world’s most successful entrepreneurs and business leaders. 5. London universities provide a wide range of courses. The 45 universities in London offer more than 30,000 courses for students. This provides international students with endless opportunities to study what they want — what they are passionate about. Undergraduates can pick three- or four-year programs, including one-year work placements to gain practical experience. London is surely a city to consider for post-secondary studies. The city appeals to youth of all cultures and ages. The potential to build lasting relationships with people from around the world while getting a quality education makes London an easy location to consider. This student-friendly city should definitely grace anyone’s list of top cities in which to study.